When tracing back through history, it’s hard to pinpoint the exact day when the construction of the U.S. Capitol Building was completed. The Capitol, like the nation it represents, has continued to grow and change over the years, all the way up until the most recent addition of the Capitol Visitor Center, which opened five years ago today. So while there may not be an exact "completion date" for our U.S. Capitol Building, there is one day that truly stands out in its history — December 2, 1863, exactly 150 years ago. On that day, the Statue of Freedom — which tops the Capitol Dome — was lifted into place atop the recently constructed cast-iron Dome. Up until that point, the Capitol looked quite different than what we see today. It was a much smaller building, representing a smaller nation. As the country grew, so did the need to expand the Capitol. The U.S. Capitol Building in 1846. By 1850, the size of the Capitol Building could no longer accommodate the increasing numbers of representatives from newly admitted states. Architect Thomas U. Walter was hired to extend the north and south wings of the building. On July 4, 1851, President Millard Fillmore laid the cornerstone for the northeast corner of the House wing, marking the beginning of this expansion. 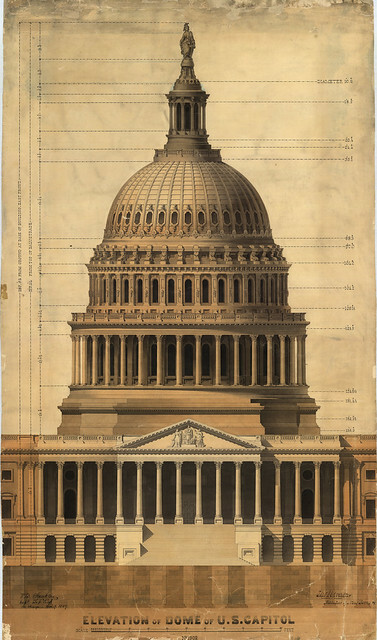 As the new wings were constructed, more than doubling the length of the Capitol, Walter realized the Capitol's original Dome no longer suited the building's proportions. He designed a new cast-iron Dome, which still stands atop the Capitol today. On May 11, 1855, Montgomery C. Meigs, engineer of the Capitol, wrote to artist Thomas Crawford commissioning him to create a statue to top the new Dome. Meigs provided guidance to Crawford for his design, writing, "We have too many Washingtons, we have America in the pediment. Victories and Liberties are rather pagan emblems, but a Liberty I fear is the best we can get." Crawford designed a statue representing Freedom that underwent multiple revisions by Secretary of War Jefferson Davis. Crawford's final design was approved in April 1856, but he would never see the statue gracing the Capitol Dome. He died suddenly in 1857, leaving his widow to ship the plaster model from his studio in Rome to the United States. Drawing of the elevation of the Dome of the U.S. Capitol by Thomas U. Walter in 1859. Beginning in 1860, the statue was cast in five main sections by Clark Mills, whose bronze foundry was located on the outskirts of Washington. Work was halted in 1861 because of the Civil War, but by the end of 1862, with the help of enslaved laborer Philip Reid, the statue was finished and temporarily displayed on the Capitol Grounds. On December 2, 1863, the world first saw the Capitol we recognize today when the final piece of the Statue of Freedom was raised atop the Capitol Dome to a salute of 35 guns and answered by the guns of the 12 forts around Washington. 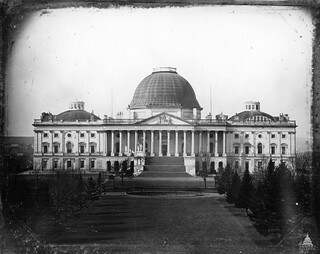 Just 13 days after President Lincoln delivered his Gettysburg address the Statue of Freedom was raised atop the new Capitol Dome and it simply symbolized that this nation, under God, shall have a new birth of freedom—and that government of the people, by the people, for the people, shall not perish from the earth. I am curious if any artist renderings of Freedom exist depicting her in full color? I can imagine she would be magnificent.